Austrian painter Giacomo Francesco Cipper (1664–1736), known as "il Todeschini" (literally "the little German"), moved to Milan in 1696. Like others before him, Cipper was interested in painting the daily reality of humble people. In his constant search for truth, he captured seemingly insignificant scenes that marked their working lives, their rare moments of rest (Drinker, Card Players) or scenes from everyday life (The Fight, Operation of the Bohemian Dentist, etc.). But it is more how Cipper approached themes than the themes themselves that defines the originality of his work. By their life-like size, their almost caricatural expressions and the way they call the viewer to witness, similar to the theatre or the farce, these men and women reveal Cipper's sense of humanity. 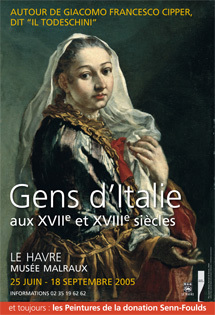 Around twenty of the artist's paintings from French museums are reunited for the first time. When compared to the works of his precursors, Keilhau and Boselli, or his followers like Ceruti, they attest to a realist movement that spread through Italy in the 17th and early 18th centuries, drawing inspiration from the theatre and scenes from the streets or everyday life, far removed from the concerns of flamboyant baroque.